Here are some pictures from a recent snowfall at my house. How Much Snow Did I Get? Have students make an estimate. Ask them for a guess that is probably a little too low and one that is probably too high. 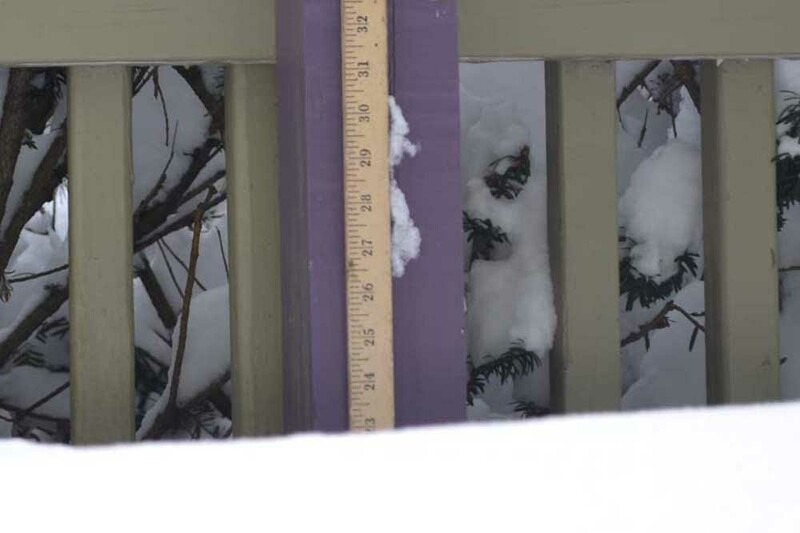 Ask students "What information would be useful to help figure out how much it snowed?" Answer - It snowed for 23 straight hours and we ended up with two snow days (no school). Have students use this info and the pictures in the slide show to make a prediction as to how many inches of snow fell by the end of the storm. Students should describe how they arrived at their prediction. You may also have students use this Desmos graphing calculator which was made for this lesson. The data for the lesson is all set up and their are sliders for students to try linear, quadratic and exponential models. Click here to see how much snow had accumulated after 23 hours. Part Two of this lesson is our Snowfall Rate Per Hour Activity which focuses on graphing and finding average snowfall rates (slope) in this scenario. Students create a graph and determine the average snowfall rate for various periods of time in this story. Which time period had the greatest average snowfall rate? How does this time period's graph compare to other time periods? Students investigate slope and steepness in an authentic context.